The 47.55 metre motor yacht Amphitrite, listed for sale by Curtis Stokes at Curtis Stokes & Associates, has been sold with Jim Webster at Webster Associates representing the buyer. 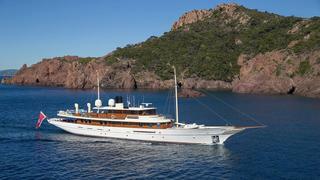 Rumour has it that her selling owner was author JK Rowling, who is believed to have bought the yacht a year ago. It's also rumoured she bought Amphitrite from Hollywood star Johnny Depp, when she was named Vajoliroja. Some suggest the connection to Johnny Depp is easy to see, as she takes the name of Vajoliroja from the first two letters of the name of his then-girlfriend Vanessa Paradis, the actor's name, and the names of their children Lily Rose and Jack. When said aloud it also recalls the Jolly Roger flag used in the Pirates of the Caribbean films. Built in steel and aluminium by Turkish yard Turquoise to a design by Tanju Kalaycioglu, she was inspired by the designs of the 1930s and delivered in 2001. Previously known as Vajoliroja, she received a refit in 2009 with a new interior by Redman Whiteley Dixon. The interior takes original Honduran mahogany panelling and blends it with custom-built Art Deco-influenced furnishings, vintage fabrics, and vintage accessories. Providing all the amenities of a modern vessel without losing her old-world charm, she cleverly intermingles the old with the new, providing high quality entertainment with state-of-the-art electronic equipment blended in with the décor throughout. Amphitrite sleeps 10 guests in five cabins. The master cabin faces forward on the main deck with remarkable 180 degree views. All four guest suites are located on the lower deck and include a VIP suite, a double, a twin, and one bunk cabin with upper and lower berths large enough to sleep adults. Powered by two 2,250hp Caterpillar 3406C engines, she has a cruising speed of 12.5 knots, giving a range of 3,200 nautical miles and is fitted with Quantum zero-speed stabilisers. Amphitrite was asking €17.5 million.